Custom cushions made to order – it sounds nice because it is! David and Iryna Newton of Cushion Café in Phoenix Arizona are two smart entrepreneurs who have created a name for themselves in the cushion industry by sticking to one core virtue: cut to the core of the thing and do what works. So when they came face to face with the happy problem of a rapidly growing business they knew they needed a way to ramp up their operation. Their aim was to meet the increasing demand of online sales without renting more space or needing to hire and train more employees. It seems fitting for the Phoenix heat that the machine they purchased comes with an optional Hot Knife cutting attachment in addition to the standard 28mm steel rotary blade. We spent the first day of training using the Hot Knife to cut and finish the edge of Sunbrella and other similar upholstery synthetics but day two was all about the rotary blade. Swapping between the Hot Knife attachment and the traditional rotary blade takes about 15 minutes from start to finish – this is not including the time needed for the Hot Knife itself to cool down. In addition to swapping the cutting element, we also established a good process for how to change the cutting surface on the table from steel sheets for the Hot Knife to HDPE plastic sheets for the rotary blade. 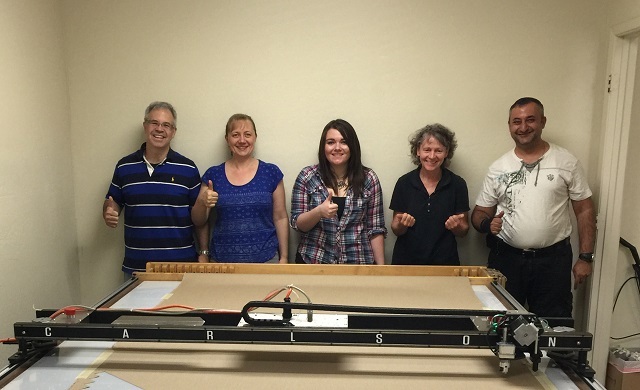 Photo of PT-72 Plotter Cutter after installation. Note the hot knife attachment and steel cutting surface. Hot Knife circle in Sunbrella – the Hot Knife melts the edge of the material as it cuts, removing any potential for fraying. Cushion Café seized on automation as a way to increase their throughput and rightly knew that this new technology would impact their entire operation. Transitioning to a plotter cutter removed their employees need to do any patterning, tracing or cutting and allowed them to focus completely on sewing finished parts. For some specific jobs in particular such as welting, their employees were spending inordinate numbers of hours tracing and cutting. A classic example of a bottleneck. Welting is the banded strip of material that runs along the sides of a rectangular pedestal cushion. 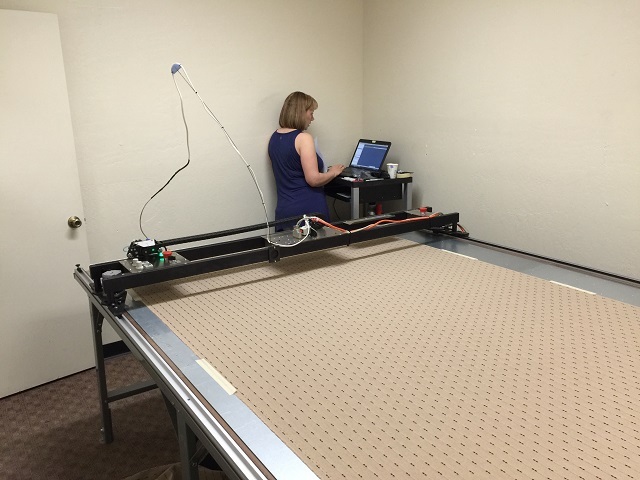 Welts need to be cut 45 degrees across the fabric to best utilize the natural stretch of the material. Cutting welts for the edges of cushions is especially tedious as even smaller cushions might require hundreds of inches of welting. To make the hundreds of inches of welting required for the job we made rectangular strips to our desired dimensions, rotated them 45 degrees, and them nested them side to side all using Carlson Plotmaster software. 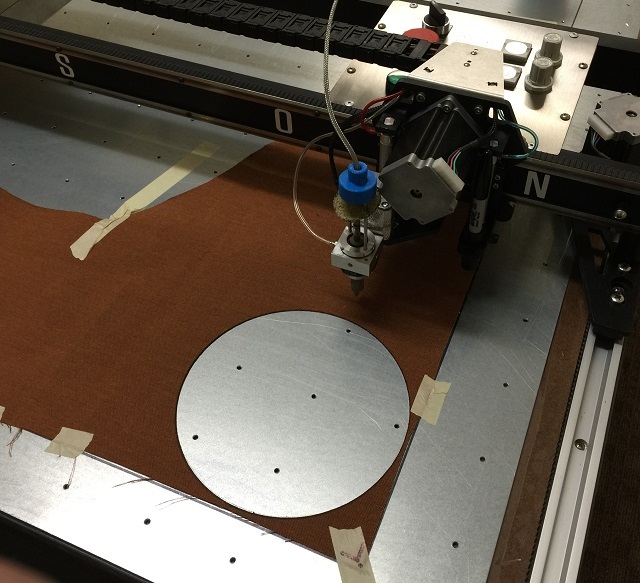 The plotter cutter makes a snap of cutting the welting, resulting in consistent parts cut at exactly the right angle to fully harness the desired upholstery material properties. Theoretically the angle could be changed to create welting with different stretch dynamics that might be better suited for different cushion applications. 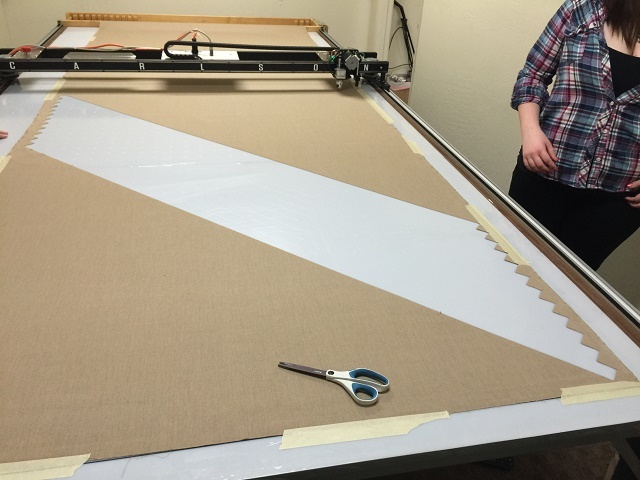 As you can imagine, cutting hundreds of inches of straight lines while maintaining a specific angle across the material is no fast or simple task. After nesting our rectangles together we were able to cut an entire order worth of cushion welting in under 10 minutes, a task that would have required one of their employees half a workday. Take that bottleneck! During my time in Phoenix David and Iryna were very welcoming – even inviting me out to watch bull riding and see some of the Arizona culture. We are all looking forward to seeing Cushion Cafe do great things!